Greetings once again, I've been playing radio quite a lot since I repaired the ft-100 /mobile rig, making many successful DX and local QSOs on 40m, 20m and 2m. The next stage of improvement for my mobile station is to fit the heil base mic that I recently acquired from Ron 2E0DOG. This should be an easier way to operate hands free as well as maintaining top quality audio. I tried a hands free kit from Watson last year but the quality of audio was poor, so I've been using the standard fist mic from Yaesu ever since. I shall fabricate a bracket to mount the mic in the Toyota at the side of the steering wheel close to the dash. The mic has a separate PTT switch that will fit at the side of the hand break. I am awaiting a mic lead which will convert the round pin plug to the ft-100 mod type plug this should hopefully be arriving soon allowing me to begin operating the new set up. The other equipment has also been working well, especially the old ft-767gx which I have been running on HF the last fortnight. It was collecting cobwebs after a 2 year rest and I had forgotten how truly great it was to use. The ft-767gx still performs as well as ever with a quality RX sound produced through the matching ext speaker and good audio quality provided through the MD1 desk mic. This rig still seems to work really well and with the new delta loop on 20m I have been having some excellent results and hours of fun. The home brew Delta loop which is horizontally mounted works exceptional well giving me a new Country to add to my list which was Alaska when I spoke with Joe KL7LF. The loop regularly brings better reports than the 6BTV and G5RV, I can strongly recommend the design posted previously. I am looking forward to getting the chance to try it out some more during the World Wide CQ contest this coming weekend. This weekend also celebrates meeting my lovely Lady Louise M3TLL which is the best thing that has ever happened. I am a lucky guy! Last weekend I got to play /portable with my hand held radio whilst taking in the breath taking views of the Yorkshire Dales from the summit of Beamsley Beacon near by to Bolton Abbey in Wharfe Dale North Yorkshire. I made some 50 mile to 80 mile distance QSO on 2m with 5 watts from the Kenwood th-f7 hand held rig. The little rig lives up to the name of "Handy" proving to work well with the Diamond SRH771 antenna for 145/433 mhz and wide band receive capabilities which I replaced the standard rubber duck with. During my operations the bands were quite busy for a change and I worked quite a few different Stations on 2m and 70cms during my walk about with Louise and Dudley our Dog. Radio has been good fun lately and I have met some nice people on the bands and I am looking forward to meeting many more the next time i switch one of my radios on. Today has been a good day for Bradford North scouts, Bradford South scouts, Windhill Shipley scouts and Keighley Scouts who have all been active on the bands with the club station call sign MX0KSC. During the event the scouts got a chance to learn about Morse code, Q-codes, phonetics, International pre-fixes and call signs, as well as speaking world wide on amateur radio, also logging and e-qsl/qsling. All of the scouts sucessfully completed a range of tasks enabling them to obtain a scouting radio communicator badge. They were all extremely happy with thier achievements. The JOTA event is running all weekend and as it is celebrating 50 years of activity on Ham radio you can imagine all of the bands are extremely active with this celebration for jota. We spoke with 20 different Stations and all scouts spoke with each operator so if you multiply 40 scouts with 20 QSOs we had a total of 800 exchanges of voice contacts and greetings messages, not bad for 7 hrs of operation. Thanks to all Stations worked and special thanks for your patience. All the best of luck to other stations who will be on air all weekend. 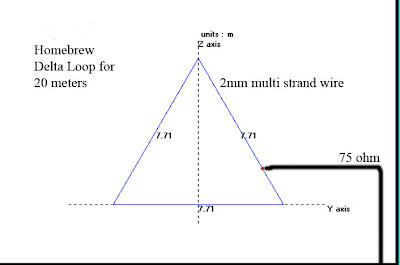 I came across a simple delta loop design courtesy of dxzone found on the net some time ago and have been planning to give it a go for a while. This weekend I had a couple of hours spare, so I decided to give it a go using some 2mm multi strand wire cable, a dipole centre and a mixture of 75 ohm and 50 ohm coaxial cable. The delta loop is supposed to be resonant on 20 meters but I found it to be a little high so at present I am tuning the Loop with my mfj-969 which copes extremely well. The resonant frequency is 13.2 MHz at the moment so the next chance I get, I shall shorten the overall length making sure that each of the three sides are still equal in length, and hopefully adjusting the antenna for maximum performance ATU free for 14.2 MHz. I believe the miscalculation in the resonant length is probably down to the fact that my wire is covered in the plastic sleeving from the manufacturer which always effects the swr as I have noticed in past experiments with dipoles you always get slight differences with sleeved and bare wire lengths, for accurate resonant results you will benefit by using bare hard drawn copper cable without sleeving. If you are into playing around and adjustments like myself plastic sleeved cable is a superb and cheap way to get the job done. Despite having to use the ATU at the moment I am getting some great results and signal reports with QSOs being made into Alaska, Canada, Azores, Belarus, Italy and Slovenia. The information given at dxzone recommends that the Delta Loop should be suspended vertically with the assistance of some tall trees. Unfortunately The trees near to my QTH are not so tall, so I decided to try the Loop in the horizontal position instead and like I said so far so good. Good luck and let me know how you get on all comments are appreciated. I have been comparing the Delta loop to the G5RV and Hustler 6BTV, it's early days but seems to be working well on the 20 meter band. The Delta Loop and 6BTV both terminate at a two position switch which allows me to switch between the two antennas very easily. 73 to all and thanks for visiting Ham Radio, good Dx de 2E0HTS Simon in Yorkshire, North England. 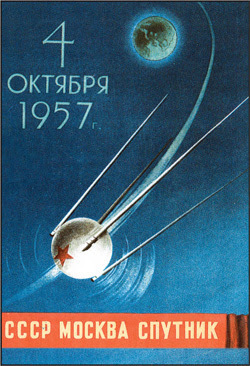 As most of you know its been 50 years since the historic launch of Sputnik. This link will take you to an interesting artical on Sputnik at the ARRL website. Its well worth a read if you havent seen it 73 all the best.